Kia will show a concept for its new small minivan at the Geneva auto show in March. The production version of the car, code-named YN, will be built at the Hyundai factory in Novosice, Czech Republic, later this year. The minivan will share the same platform as the Kia Rio. It will go on sale toward the end of 2009. 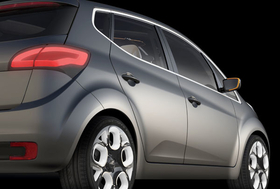 The concept has been designed by Gregory Guillaume, Kias chief European designer.